I first learned of the Diabetes Prevention Program when Lifestyle Coach Shannon shared the DPP program with the Rotary Club of Clay County. I had several risk factors for developing type 2 diabetes: overweight, over age 45 and gestational diabetes. Shannon promised this program was not a diet. I hate diets. Diet is a four-letter word and the first three letters spell die. Who needs that! I have struggled with weight my entire adult life. I broke my ankle in 2015 and quickly grew from 215 pounds to 251 pounds. When Shannon spoke to our Rotary Club, I was heavier than I had been in my whole life. I was constantly uncomfortable. I had tried several diets and lost weight, but I would invariably gain back what I lost plus a few bonus pounds. I’ve probably gained and lost the equivalent of 7 people during my lifetime. DPP promised to be a lifestyle change. The goal for the 12-month class was to lose 7% of your body weight. That didn’t seem too daunting. What did I have to lose, except unwanted pounds? My goal for the class was to lose 17 pounds. By the end of the 12 months, I had lost 31 pounds. I have continued making healthy choices and my total weight loss to date is 75 pounds. I am within 16 pounds of the goal weight my family doctor set for me. This program allowed me to be myself and make healthy choices that made sense for me personally. The tracking helped me realize how much I was really eating in the beginning. The gradual reduction in food intake made the transition to a healthier menu more sustainable. As I made slight changes, I started losing weight and the more I lost, the more motivated I was to make healthy choices. The program introduced new concepts in a relatable way. I started to believe it really could be as easy as moving more and eating less. The “my plate” concept helped me to think of meals in a more balanced way. I never felt deprived and learned coping skills for stress eating and ways to work treats into a healthy meal plan. Shannon made encouraging comments in our food journals. For example, I was eating fruit snacks every day. Shannon suggested for the same fat gram/calorie count I could be eating real fresh fruit. This led to a challenge with a classmate to try new exotic fruits. The comradery of the classroom was helpful as we could share openly and learned very quickly that we were all experiencing the same thing. We felt safe to share anything. I have boundless energy and confidence now and have taken up jogging. I have competed in four 5K runs this year and have placed in the top three for my age group in each one. I even won first place in the Grand Masters category at one event. The most powerful lesson I have learned is that I can get up each day and forgive myself for any unhealthy choices I made the day before. I used to feel like one day of overeating would completely derail my weight loss plan. Now I realize I can start each day new. One day in the span of a healthy lifestyle is just one day. I grew up watching my grandfather suffer with diabetes and watched him die from it when I was 20 years old. As I grew older, I found out that a lot of my family members were affected by this disease also. While pregnant with my second child in my mid-30s, I developed borderline diabetes which continued until my doctor called it to my attention. Also, at the same time, my blood pressure rose to the point that I was put on medication in 1998. As the doctor monitored my blood pressure, the sugar level was rising at the same time. Six-month check-ups and annual physicals started focusing on blood pressure and sugar levels. Exercise is not anything new to me. I have always been very active by running, playing tennis and walking. I used exercise to fight my blood pressure and the rising of blood sugar levels but found out that my A1c continued to rise the harder I worked. The doctor and I discussed my family history of diabetes. We discussed ways to bring the A1c down with dieting and knowing what kind of foods to avoid so she wouldn’t have to put me on medication. For years, I have avoided having to take medication, and finally in 2016 it was evident that I had to do a complete change in my eating habits and exercise regimens. My doctor mentioned to me a prediabetes group at our local health department which had been a success to some of her patients. At this point, I was willing to do anything to avoid medication or insulin. I started the group in January 2017 and learned a lot in how to combat prediabetes issues. Working with a nutritionist has been a life saver for me because I learned about calories, fat intake, carbohydrates, fiber, and sugar. She taught me what to eat and how much. Exercise has been an emphasis as well. In the group, we share each other’s problems and struggles which help us as a group learn how to manage those demons. I credit part of my success to this group and what I have learned from it. I now know how my body works and what my body needs and that it can make a difference and keep me healthy and rid of diabetes. My hope is to not live with this disease the rest of my life. I work as a Registered Nurse and Health Educator for the Clay County Health Department; this is my DPP Success Story. In 2014, I received lab work that showed that I had borderline high cholesterol, pre-hypertension and a BMI in the obese range. My primary physician told me that I needed to start exercising, so I purchased a mountain bike shortly afterward and started riding it. By Summer of 2016, despite riding my mountain bike at least once a week, I had gained another 10lbs, so I decided to buy a Fitbit and started concentrating on getting my steps in every day. December of 2016, I was getting my steps in but had managed to lose no weight and was also taking Ranitidine twice a day along with all the tums I could chew for indigestion. My cholesterol had dropped some, but it still wasn't good, and my fasting blood glucose had crept up. I say all of this to say that despite my best efforts, I was making no progress on my own. So, with permission from the Health Director to attend classes in place of my lunch break, I decided to join a DPP class being held at our Health Department. I started DPP on January 17th of 2017. At the first class when we listed our six-month goal of losing either 5 to 7 percent of our starting weight (286.6 for me) I chose to attempt a 7% (20lbs) loss but had doubts that I could achieve that in 6 months. However, I decided that I would give it my best shot and do this program to the best of my ability. By the second class, I had already lost several pounds to my surprise. When Shannon reviewed my food logs, I followed her recommendations and started using my food logs to help with my eating decisions (i.e. pick a food with more protein if I was low, or less sugar, etc.). By April 18th of 2017 (our 8th Class), I had already achieved my goal weight. Around that time, I also realized that I couldn't remember the last time I had had an antacid. Fast forward to today and I have lost over 100 pounds, my cholesterol is in a normal range, my fasting glucose is great, my blood pressure is well into the normal range, and I have so much more energy. I still mountain bike but can go almost twice the distance in the same amount of time and have even started running again. Losing weight has also allowed me to do other things I enjoyed before my weight gain such as hiking, and backpacking. Shannon and DPP have changed my life and have given me new hope for the future. For me, this has truly been a lifestyle change. My family eats way more fresh fruits and vegetables, we have cut almost all our sugary drinks out of our meals, and we base our meals on their nutritional value along with taste. We have experimented with different foods such as quinoa (which I had never heard of before our DPP Class). My wife actively looks for ways to make her recipes healthier and helps me with the meal prep I do to ensure I know what portions I am eating. I can truly say that DPP has changed my life, and I can contribute my success to this program. A diagnosis of prediabetes was not totally unexpected. My physician and I discussed options and I went home with a treatment plan to lose weight. I wavered in my calorie counting lost weight and gained the weight back plus some. I went to the first DPP session. The participants were quiet. A slim young lady went through the teaching points, had us sign a commitment form and I thought relating to this instructor and group would not be of value to me, but the group started to become more open and expressive at the second session. By the third session I knew it was time to get on board or quit. The developing group comradery made me understand the dynamics of the issue. I was learning the process could work. I also learned I had support from the other group members. Creating an action plan and making a commitment to myself answered the question of ‘What will I do?’ Creating the value for me was my responsibility. At home the measuring cups came out. If it went in my mouth, it went on the food diary – no more cheating on myself. Evaluating the food diary was an eye opener. Each session gave me more confidence and ways to cope with challenges. The weight started to come off. I learned to balance my calorie intake and my activity. Moderate activity burns calories. Now I look forward to running the vacuum or raking leaves. I stay active. The benefits are worth the effort – I feel better and I like that. My next goal is to strengthen muscle by weight lifting. My series of sessions will be coming to an end soon. I know it will be hard to keep off the lost weight, but I now have resources and the confidence to do it. I not only look better but I feel better! The moment that Kim discovered she was at risk for type 2 diabetes, she knew she had to start making changes and that she needed help to do it. 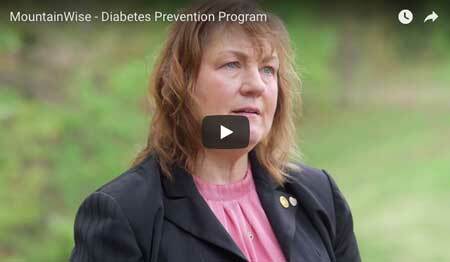 Kim heard about the YMCA’s Diabetes Prevention Program and thought it would be right for her. Our trained lifestyle coach could help her reduce the risk of developing diabetes by supporting her to make small attainable goals in weight loss, physical activity, healthy eating and stress reduction. Prior to participating in DPP, Kim’s weight was putting a lot of stress on her knees, which limited her ability to walk or be physically active, without experiencing pain. Kim says she was also having other health issues. “I was a little overweight, my blood pressure was going way up, and my glucose levels were high. When I found out about the Diabetes Prevention Program at the Y, I decided to take the course. Marjorie, Diabetes Prevention Coordinator, said Kim was really an inspiration. Kim had shown that small steps can make life changing differences over time. “Kim is the one who started out not being able to swim and is now swimming laps and taking water aerobics classes. You can also see her taking group exercise class almost every morning,” says Marjorie. We had a participant come in to the program as a self-referral. At the beginning of the program her A1c 5.9. She was told by her primary care physician that her A1c level was "nothing to worry about". At the completion of the program, the participant had lost 20 pounds and dropped her A1c from the 5.9 (measured 11/2016) to 5.2 (measured 8/2017). She lost a total of 7.4% of her [body] weight. This is her quote: "The Diabetes Prevention Program has given me the tools to be successful at losing weight and decreasing my A1C. The participant credits the program for changing her life and had this to say - “I am no longer have prediabetes, and the new outlook I have as it relates to food has influenced my family to also live a healthier lifestyle." I was followed routinely by my primary care provider (PCP). I became very concerned about PCP’s threats to begin me on diabetes medications due to my impaired glucose function, and continued A1c elevation. Employed in the healthcare environment, I am in engaged in my health but also resistant to go on the Metformin. Me and my spouse ate out for most meals and of course enjoyed the sweet beverages and desserts of North Carolina. We tried various “diets” and eating lots of vegetables and fruits because I always felt that all veggies are healthy. I wanted a change for my health, so I enrolled in the Hertford Health Maintenance Alliance’s diabetes prevention class that began July 2017. At the completion of the first 16 class sessions, I had achieved and surpassed my individual goal of 7% weight loss. Now, I have lost more than 14 lbs. I am currently maintaining my desired body weight and BMI. I have increased my weekly [physical] activity to over 300 minutes per week, and I have started incorporating lunch walks during my work week. My spouse and I continue to eat out for some meals, but we now understand healthy eating and portion control as well as the effects that all of those sugary foods and beverages can have on our health. Tracking my foods, beverages, and [physical] activity continues to be a part of my daily routine as I reevaluate my goals. I attribute so much of my success to the DPP class engagement as well as encouragement and support from the group meetings. We have seen remarkable success with the Diabetes Prevention Program (DPP). We had 12 participants enroll in the program, after completing 17 weeks of the class series, the group has collectively lost a total of 95 pounds, which is average of almost 8 pounds for each participant. Goal weight loss of 5% or greater has been achieved by 62% of participants, and 75% of participants have achieved 150 minutes of physical activity per week. Two participants have shown a notable drop in blood pressure. Another participant is tracking blood pressure to see if her medical provider will discontinue blood pressure medications because of the lower readings she been experiencing. All 12 participants are still engaged in the program and coming to class, and as the facilitator of the group, I have lost weight as well! One participant had lost almost 40 pounds. The participant really adjusted to choosing healthier eating options and lifestyle habits. Several participants are very close to reaching their 5% weight loss goal, and many participants have reported that the lifestyle change classes have been very helpful at identifying ways in which they can become more active, and how to cook healthier options that are affordable and tastes good. Many of the participants report feeling more alert and energized and have been able to walk for longer periods of time without getting tired. One participant missed 2 consecutive classes and was eager to return to class and get back on track. After returning to class, she reported she was so happy, feeling better and had lost 5 more pounds. © 2019 Diabetes Free NC. This site is maintained by the NC Division of Public Health and partner organizations.